Growing up, my family spent every summer at a spring-fed lake on the top of a Pennsylvania mountain. The elevation was high enough that the plant life was much different than what we saw in town. The soil was acidic and all clay. Trees did not grow as tall, and moss was a lot easier to grow than grass. But that mountain was covered in wild blueberry and wintergreen. To this day, the scent of a crushed wintergreen leaf brings me straight back to my childhood. Wintergreen is one of the few plants that, unless there is deep snow, I can forage year-round. 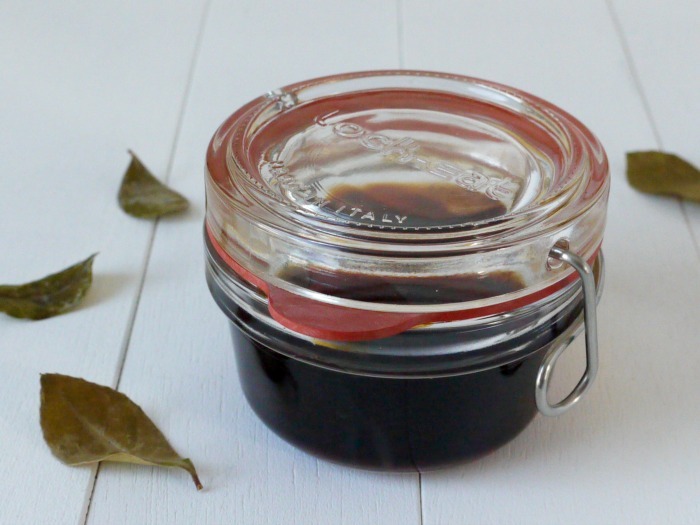 Making wintergreen extract is a great way to capture its amazing flavor. My favorite way to use the extract is in homemade teaberry ice cream. 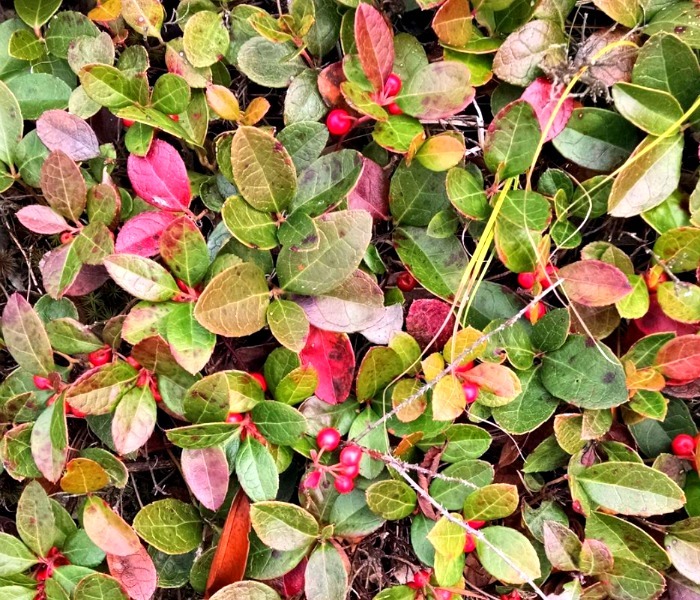 American wintergreen (Gaultheria procumbens) is an easy to forage, low-growing perennial evergreen. Also known as teaberry, it is found from Newfoundland to Georgia and west to Minnesota. A range map may be found here. 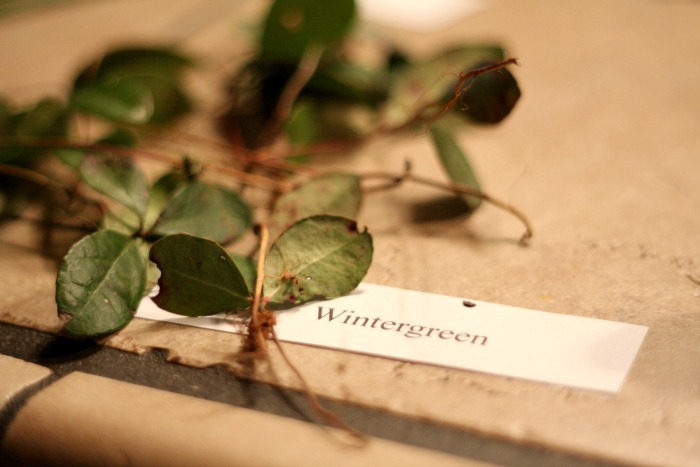 Wintergreen prefers mountainous woodlands with dappled sunlight, and tends to grow among other plants of the Heath (or Ericacea) family (like blueberry, mountain laurel, and cranberry). It creeps along the ground in acidic soil and can form a thick carpet of oval or elliptical, shiny leaves that are about 2″ long. In late summer, wintergreen forms a red berry at the base of its leaves; the berry will stay on the plant right into early winter. You’ll get the lovely taste of teaberry when you bite into a berry, but the texture is waxy and dry; I prefer not to swallow. Crushing the leaf is the surest way to positively identify wintergreen. If crushing it doesn’t produce a minty, wintergreen aroma, it’s not wintergreen. In my area, wintergreen can be quite abundant. I know areas where I could harvest leaves for hours and still have plenty left. That’s not always the case, however, and the amount you harvest should always take this into consideration. Learn more about the ethics of foraging here. Where we harvest, the wintergreen rarely sees more than dappled sunlight, and therefore does not produce a lot of berries. While wintergreen does prefer shadier areas, it will also grow in full sun, and those are the areas where you will find more of the berries. The leaves will often be red in color. Wintergreen contains methyl salicylate, an aspirin-like chemical, which can help to alleviate the pain of headaches, muscle cramps, joint pain and more. It can also bring relief for digestive issues. But if you are allergic to aspirin, you should avoid wintergreen. All that is needed to make wintergreen extract are wintergreen leaves, berries if you can find them, and vodka. I prefer a brand of vodka that is GMO-free – I use Absolut brand for my extracts. It’s made from deep well water and winter wheat grown in Sweden (where GMOs are not allowed). If wintergreen does not grow in your area, dried wintergreen leaves are available here. While I prefer using fresh leaves, dried leaves do make a fine extract. I prefer using fresh leaves for the extract, but dried leaves may be used as well. 1. Thoroughly rinse and dry the wintergreen leaves. 2. Tear or coarsely chop the leaves. 3. Place the leaves in a 2 cup glass jar and cover with the vodka. Place the lid on the jar. 4. Allow the extract to sit in a dark place for at least 6 weeks. Shake occasionally. 5. At this stage the extract will be weak. For best results, strain the vodka, and add another cup of wintergreen leaves. Allow to sit another 6 weeks. I often repeat this step one more time for really amazing wintergreen extract. 6. Use to flavor ice cream, or add to chocolate chip cookies or brownies. I also have childhood memories of teaberry. We went to my grandparents’ cottage every summer in MI & we would take walks to the forest near the beach & look for teaberry. This was my first experience with foraging & plant identification! It was like finding a treasure & now I’ve been wanting to grow it since I started with herbs, since I can’t find it around me. If I eventually find it It’ll be so excited to make an extract. Thanks! Oh, I so hope you can find it; such an amazing plant. It was one of the first I fell in love with as a child, along with wild blueberry and Mountain laurel. I love the flavor of Wintergreen. Thanks for the recipe and description. When I get moved back to Michigan, I will be finding some new plants to grow, and Teaberry will be among them. Wintergreen is definitely worth going home for!